She was labelled "the most beautiful girl in the world" and her co-inventor "the bad boy of music" yet way back in 1942 they took out a patent covering the vital radio technique that we now call spread spectrum. The Red Army invaded the young nation-state of Finland, in the full expectation of routing the small, ill-equipped Finnish army. But Finland held out for 105 bitterly cold, fiercely combative days, until a peace agreement ended the short, savage Winter War. Spain: Day 63 of 985 of the Spanish Civil War. Spain: Day 428 of 985 of the Spanish Civil War. CBI - China: Day 73 of 2,987 of the 2nd Sino-Japanese War. Day 36 of 106 of the 2nd Battle of Shanghai. Day 17 of 70 of the Battle of Taiyuan. Spain: Day 793 of 985 of the Spanish Civil War. CBI - China: Day 438 of 2,987 of the 2nd Sino-Japanese War. Day 99 of 139 of the Battle of Wuhan. USA: American aviation hero Charles Lindbergh makes his first anti-intervention radio speech, supported by former president Herbert Hoover, Theodore Roosevelt Jr, Henry Ford and others. 4) his tremendous contributions to the war effort after Pearl Harbor. 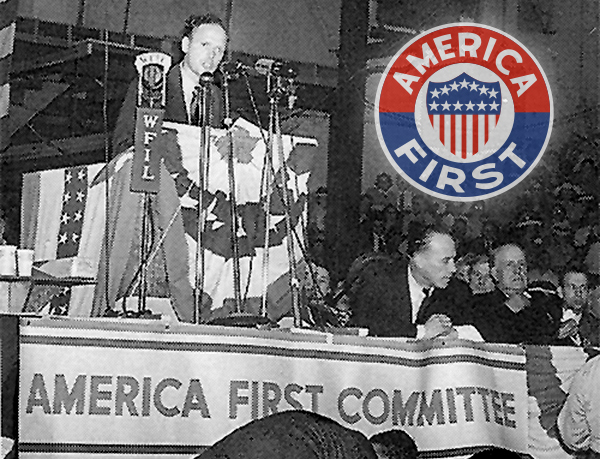 The America First Committee (AFC) was the foremost non-interventionist pressure group against American entry into World War II. Peaking at 800,000 paid members in 650 chapters, located mostly in a 300-mile radius of Chicago, it was one of the largest anti-war organizations in American history. It was established on 04 Sep 40 by Yale Law School student R Douglas Stuart Jr, along with other students, including future President Gerald Ford, future Peace Corps director Sargent Shriver, and future US Supreme Court justice Potter Stewart. Its most prominent spokesman was aviator Charles Lindbergh. Other celebrities supporting the AFC were novelist Sinclair Lewis, poet E E Cummings, Washington socialite Alice Roosevelt Longworth, film producer Walt Disney, and actress Lillian Gish. Many student chapters included future celebrities, such as author Gore Vidal and future Presidents Gerald Ford and John F Kennedy, who sent a contribution with a note saying "What you are doing is vital." "Our principles were right. Had they been followed, war could have been avoided. No good purpose can now be served by considering what might have been, had our objectives been attained. We are at war. Today, though there may be many important subsidiary considerations, the primary objective is not difficult to state. It can be completely defined in one word: Victory." Atlantic: Aircraft Carrier HMS COURAGEOUS is torpedoed by U-29 southwest of Ireland, killing 515, but 687 sailors survive. Poland: Day 17 of 36 of Germany's Invasion of Poland. German troops capture Kutno, Poland and Brest-Litovsk (now Brest, Belarus). Poland: Day 1 of 20 of the USSR's Invasion of Poland. Soviet troops invade Poland from the east on the pretext of protecting Poland. The Polish government seeks asylum in Romania. Soviets take the area of Katyn. CBI - China: Day 803 of 2,987 of the 2nd Sino-Japanese War. Day 5 of 26 of the 1st Battle of Changsha. 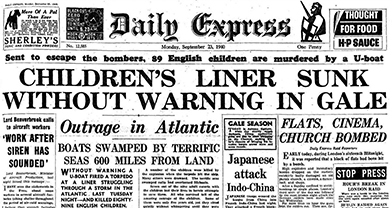 Atlantic: British ocean liner SS CITY OF BENARES, evacuating children to Canada, is sunk 600 miles from land by U-48. 77 out of 90 children are lost, a total of 260 people are killed. 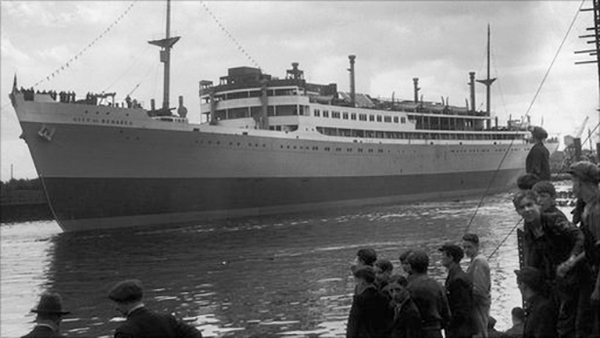 SS CITY OF BENARES had left Liverpool on 13 Sep 40 on its 2,500 mile voyage. It was part of the Children's Overseas Reception Board (CORB), a British government sponsored organization that evacuated 2,664 British children from England, so that they would escape the imminent threat of German invasion and the risk of enemy bombing. The children were sent mainly to the four Dominion countries, Canada 1,532 (in nine parties), Australia 577 (three parties), New Zealand 202 (two parties), and South Africa 353 (two parties), but also some to the USA. 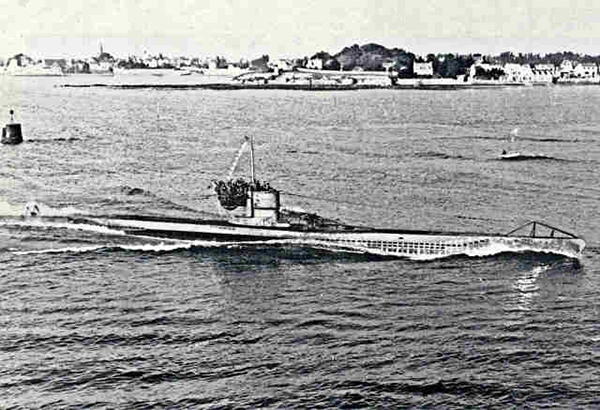 Late in the evening of 17 September, the CITY OF BENARES was sighted by U-48, who fired two torpedoes at her at 23:45 hours. Both torpedoes missed, and at 00:01 hours on 18 September, the U-boat fired another torpedo at her. The torpedo struck her in the stern causing her to sink within 30 minutes. 15 minutes after the torpedo hit, the vessel had been abandoned, though there were difficulties with lowering the lifeboats on one side of the ship. Many passengers and crew members had been trapped below deck, and those left struggling in the water had difficulty getting to, let alone aboard, the lifeboats. The nearest allied ship was 300 miles away and would not arrive for some 24 hours, during which time the seas became violent and many drowned or died of exposure. U-48, the U-boat responsible, had moved its searchlight over the area where the Benares had sunk and knew there were survivors, but made no effort to rescue them. The total disregard for the plight of the survivors horrified the civilized world. 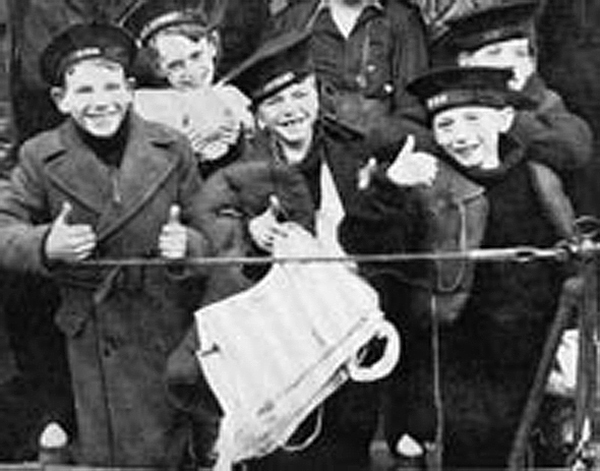 By the time HMS HURRICANE arrived on the scene to pick up 105 survivors, lifeboat 12 had drifted away and would not be spotted for another seven days. They had three weeks supply of food with them, but only seven days of water. In total, 248 of the 406 people on board, including the master, the commodore, three staff members, 121 crew members and 134 passengers were lost. 77 of the 90 children on board the CITY OF BENARES tragically lost their lives, resulting in the complete abandonment of further overseas evacuation plans. The story of the sinking of the SS CITY OF BANARES is a stark reminder of those dark days of WWII when terrible things happened to men, women and children. ETO - UK: Day 12 of 258 of the Blitz. Thus far 2,000 civilians have been killed and 8,000 seriously injured, compared to 250 casualties in their military campaigns. ETO - UK: Day 70 of 114 of the Battle of Britain. Hitler postpones Operation SEA LION, the plan to invade Britain, until further notice. MTO - Egypt: Italian 10th Army captures Sidi Barrani. At this point the Italians halt their offensive and begin to construct a number of fortified camps. East Africa: Day 100 of 537 of Italy's East African campaign in the lands south of Egypt. CBI - China: Day 1,169 of 2,987 of the 2nd Sino-Japanese War. 308 of 381 of the Battle of South Guangxi. Day 29 of 42 of the Hundred Regiments Offensive. ETO: Beginning of general deportation of German Jews. Russian Front - Finland: Day 88 of 164 of the Battle of Hanko. The Soviets will be forced off their leased naval base. Russian Front - Finland: Day 14 of 28 of Finland's reconquest of East Karelia in southern Finland. The Soviets continue withdrawing from Finland back to Leningrad. Russian Front - Finland: Day 81 of 142 of Operation SILVER FOX, a joint German-Finnish campaign to capture the Russian port of Murmansk in the Arctic. The German troops continue withdrawing back into northern Finland. Russian Front - Finland: Day 79 of 140 of Operation ARCTIC FOX, a joint German-Finnish campaign against Soviet Northern Front defenses at Salla, Finland. Russian Front: Day 88 of 167 of Germany's Operation BARBAROSSA, the overall invasion of the USSR. Russian Front - North: Day 10 of 872 of the Siege of Leningrad. Russian Front - South: Day 41 of 70 of the Siege of Odessa, Ukraine. Russian Front - South: Day 26 of 35 of the 1st Battle of Kiev, Ukraine. MTO - Libya: Day 161 of 256 of the Siege of Tobruk. Middle East: Day 24 of 24 of the Anglo-Soviet invasion of Iran. British and Russian troops occupy Teheran after Iran fails to comply with their demand to expel all Axis nationals. East Africa: Day 465 of 537 of Italy's East African campaign in the lands south of Egypt. CBI - China: Day 1,534 of 2,987 of the 2nd Sino-Japanese War. Day 12 of 33 of the 2nd Battle of Changsha. Russian Front - North: Day 375 of 872 of the Siege of Leningrad. Russian Front - North: Day 136 of 658 of the Siege of the Kholm Pocket, USSR lays siege to the Kholm Pocket but the Germans hold out for a about a year and a half. Russian Front - Center: Day 50 of 64 of the 1st Battle of Rzhev-Sychevka, Russia. Though it will end in a stalemate, it will keep German troops from going to Stalingrad. Russian Front - South: Day 82 of 150 of Germany's CASE BLUE, the failed offensive to take the Caucasus oil fields. Russian Front - South: Day 26 of 165 of the Battle of Stalingrad, the bloodiest battle in human history. Bitter street fighting breaks out in the northwest suburbs. MTO - Libya: US B-24s night bomb Benghazi. MTO - Greece: US B-24s attack shipping at Pylos Bay, Sphakia, Khalones, and Pylos Island during the day. East Africa: Day 136 of 186 of the Battle of Madagascar. Peace talks break down rather quickly. CBI - China: Day 1,899 of 2,987 of the 2nd Sino-Japanese War. PTO - Alaska: Day 103 of 435 of the Battle of Kiska, Aleutian Islands. The US and Canada will defeat the Japanese invaders. PTO - Malaya: Day 211 of 357 of the Battle of Timor Island, a long guerrilla war ending in Japanese victory. PTO - New Guinea: Day 59 of 119 of the Battle of the Kokoda Track. The Australians continue pushing back the Japanese troops. This will become an Allied victory. PTO - Solomon Islands: Day 42 of 187 of the Battle of Guadalcanal. Russian Front - North: Day 740 of 872 of the Siege of Leningrad. Russian Front - North: Day 501 of 658 of the Siege of the Kholm Pocket, USSR lays siege to the Kholm Pocket but the Germans hold out for a about a year and a half. Russian Front - Center: Day 42 of 57 of the 2nd Battle of Smolensk, Russia. Becomes a Soviet victory as the Axis are pushed completely away from the Moscow region. Russian Front - Center: Day 32 of 48 of the Battle of Bryansk, Russia. German troops continue evacuating Bryansk. Stalin prematurely announces that Bryansk has been captured. Russian Front - South: Day 25 of 122 of the Battle of the Lower Dnieper River, USSR. MTO - Italy: Germans begin withdrawing from Salerno as the British 8th Army joins up with US 5th Army. The RAF, US 9th and 12th Air Forces provide the air cover. CBI - China: Day 2,264 of 2,987 of the 2nd Sino-Japanese War. PTO - Solomon Islands: Day 34 of 56 of the Battle of Vella Lavella. The Allies will win this one. ETO - France: Day 48 of 284 of the Battle of Brittany. US 7th Army's French II Corps makes contact with the US 3rd Army's French 2nd Armored Division near Bains-les-Bains. ETO - Belgium: Day 16 of 62 of the liberation of Belgium. ETO - France: Day 3 of 236 of the Siege of Dunkirk. ETO - Netherlands: Day 1 of 9 of Operation MARKET GARDEN. The battle begins with an Allied airborne assault. US 8th Air Force provides air support. 20 Sep 44: Joint British-American attack captures a "bridge too far"
Russian Front - Finland: Day 3 of 223 of the Lapland War. Finland and Russia have joined forces to kick the Germans out of Finland's most northern province. Russian Front - North: Day 1 of 10 of the Battle of Porkuni, Estonia. Russian Front - North: Day 4 of 41 of the Battle of Riga, Latvia. Russian Front - Center: Day 4 of 72 of the Battle into East Prussia and northern Poland. Russian Front - South: Day 4 of 72 of the Battle of Belgrade, Yugoslavia. MTO - Italy: Monte Altuzzo finally falls to the US 85th Division. MTO - Italy: US 12th Air Force B-25s hit German troop concentrations facing the British 8th Army in the vicinity of Rimini. B-25s and fighters strike targets in the Po Valley. MTO - Hungary: US 15th Air Force B-17s and B-24s attack two oil refineries and four marshalling yards near Budapest. CBI - Burma: Day 170 of 302 of the Chinese Salween Offensive in Burma. CBI - China: Day 2,630 of 2,987 of the 2nd Sino-Japanese War. Day 154 of 259 of Japan's Operation ICHI-GO. PTO - New Guinea: Day 278 of 597 of the Battle of New Britain. PTO - New Guinea: Day 149 of 481 of the Battle of Western New Guinea. PTO - Palau Islands: Day 3 of 74 of the Battle of Peleliu (Operation STALEMATE II). PTO - Palau Islands: Day 1 of 36 of the Battle of Angaur, part of the larger Operation STALEMATE II. The debate over American intervention in WWII was a bitter clash of personalities and ideas that divided the nation and ultimately determined the fate of the free world. Join historian and classical scholar J Rufus Fears as he tells freedom's dramatic story from ancient Greece to our own day, exploring a concept so close to us we may never have considered it with the thoroughness it deserves.